Analog Device’s ADRV9009 RF Transceiver is designed to meet rigorous antenna density and expanded network capacity requirements. Unit provides 75 MHz to 6 GHz tunable frequency range that supports 2G/3G/4G/5G services. The transceiver allows designers to meet escalating radio-channel-count requirements of 5G massive MIMO equipment. Unit is offered in 12 x 12 BGA package and simplifies digital beamforming design for advanced cellular and phase array radar systems. 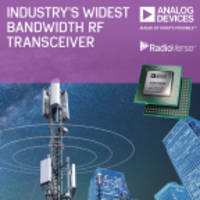 NORWOOD, Mass.--(BUSINESS WIRE)-- Analog Devices, Inc. (ADI) today expanded its award-winning RadioVerse™ technology and design ecosystem with the industry’s widest bandwidth RF transceiver, which provides designers with a single radio platform to accelerate the deployment of 5G, sustain 2G/3G/4G coverage, and simplify phased array radar design. The ADRV9009 RF transceiver delivers twice the bandwidth (200 MHz) of previous generation devices and replaces as many as 20 components, cutting power in half and package size by 60 percent. With its industry leading performance and reduced size, weight and power, the ADRV9009 transceiver meets the rigorous antenna density and expanded network capacity requirements of emerging 5G wireless infrastructure equipment and aerospace and defense systems. The ADRV9009 is the industry’s first RF transceiver to support all existing cellular standards. The device is tunable over a range of 75 MHz to 6 GHz to support 2G/3G/4G/5G services, which allows cellular equipment manufacturers to adopt a single, compact radio design across all band and power variants. This reduces product design times by as much as half while simplifying the deployment and maintenance of multi-band, multi-standard communications equipment. “For the first time, designers of cellular communications equipment have a common radio platform that can handle emerging wideband applications like 5G while delivering the high performance required by existing 2G, 3G, and 4G applications,” said Nitin Sharma, general manager of the Transceiver Product Group at Analog Devices. Because of its wide bandwidth, low power and small form factor, the ADRV9009 allows designers to meet the escalating radio-channel-count requirements of 5G massive MIMO equipment. The new RF transceiver is a single-chip TDD solution that can also be used in the design of portable, laboratory grade 5G test and measurement devices which are required for field testing of cellular and Internet of Things networks. For aerospace and defense systems, the ADRV9009 addresses the high-performance requirements of both wideband and narrowband applications such as military communications and signal intelligence. The new RF transceiver platform also features fast frequency hopping for enhanced link security and spectrum efficiency. For both advanced cellular and phased array radar systems, the ADRV9009 simplifies digital beamforming design by handling local oscillator (LO) synchronization on-chip, eliminating the need for external LOs. The RadioVerse™ design and technology ecosystem accelerates advanced radio design and development and includes market leading integrated radio platforms, software tools, evaluation and prototyping platforms, a range of reference designs, and full radio solutions. To accelerate customers’ time to market with the ADRV9009 RF transceiver, the RadioVerse ecosystem provides a JESD204B FPGA integration framework, a production-ready RF system-on-module (RF-SoM) with dual ADRV9009 devices, and a global partnership network to provide customers additional design and technical services. Analog Devices (Nasdaq: ADI) is the leading global high-performance analog technology company dedicated to solving the toughest engineering challenges. We enable our customers to interpret the world around us by intelligently bridging the physical and digital with unmatched technologies that sense, measure, power, connect and interpret. Visit http://www.analog.com.